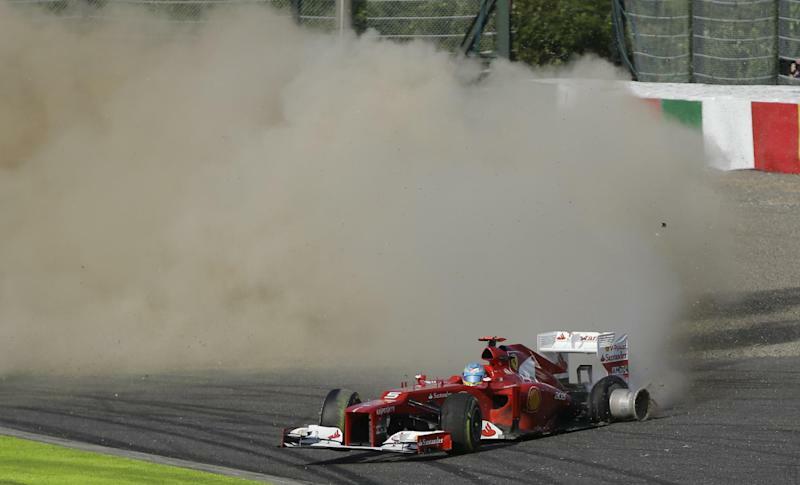 SUZUKA, Japan (AP) — Red Bull driver Sebastian Vettel won the Japanese Grand Prix from the pole on Sunday to close within four points of Formula One championship leader Fernando Alonso, who crashed out of the race at the first turn. Vettel, who also won the last race in Singapore, is now within sight of a third straight title — something only previously accomplished by Juan-Manuel Fangio and Michael Schumacher — with five races left. "It was an important step today," Vettel said. "There is still a long way to go. I don't know what happened behind me today but Alonso was very unlucky. We never know what is going to happen in the next race so it was important to take points today." Alonso's Ferrari teammate Felipe Massa was second, 20.6 seconds behind Vettel for his first podium finish since Korea in 2010, a performance that should boost his chances of staying with the team. "It's a huge relief to be back on the podium," Massa said. "It was a great race and shows we are here to fight for the victory and the podium." 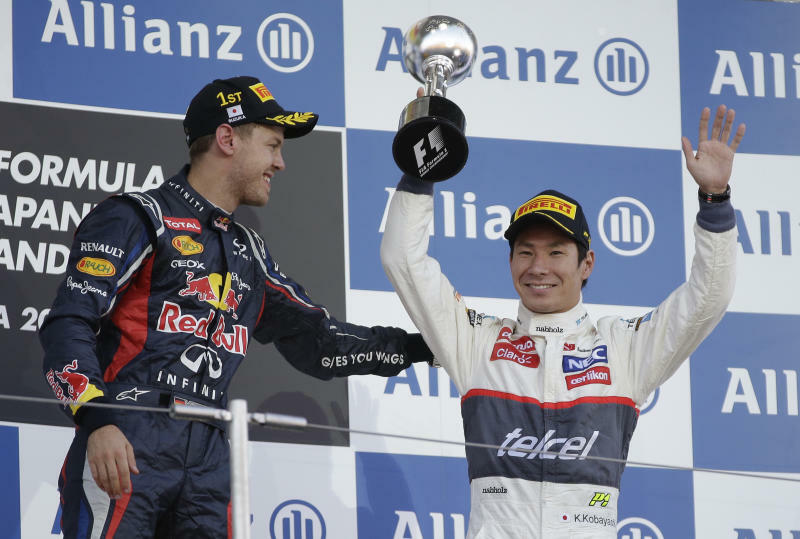 Sauber's Kamui Kobayashi delighted the home fans by taking third place — holding off a late challenge from McLaren's Jenson Button — for his first-ever F1 podium. He became the first Japanese driver on a podium here since 1990. "It was a very tough race," Kobayashi said. "I got off to a good start but really had to fight and it took everything I had to hold off Jenson. To get a podium here in Japan in front of these great fans is fantastic." 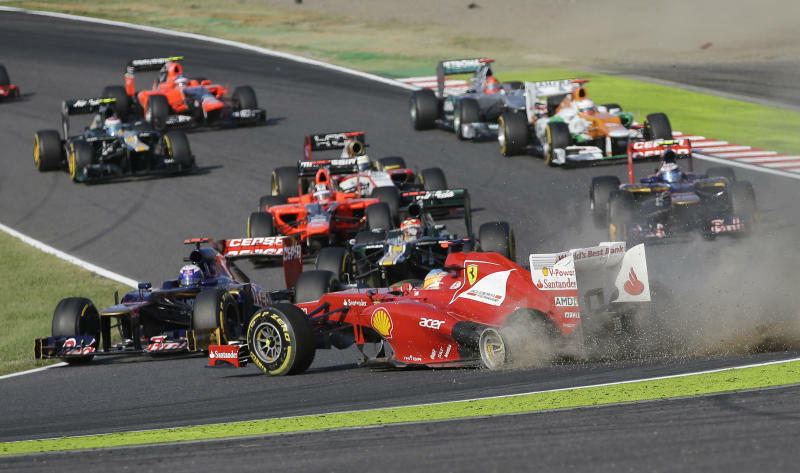 The race got off to a rocky start with a series of collisions in the first corner. Alonso made contact with the Lotus of Kimi Raikkonen and appeared to sustain a punctured tire, fishtailing off the track and the car stalled, leaving a disconsolate Alonso to trudge back to the pits. Also on the first turn, Lotus' Romain Grosjean rammed into the Red Bull of Mark Webber, sending the Australian to the back of the pack after starting from second. Grosjean was given a drive-through penalty for causing the collision, and in light of his suspension for a race for doing the same in Belgium, the Frenchman may face disciplinary action again. Also in the first corner, Mercedes' Nico Rosberg came together with Williams' Bruno Senna, ending the German's race. Vettel avoided all the trouble behind him at the first turn, and quickly established a comfortable lead. Massa overtook Kobayashi after the first set of pit stops and managed to close the gap slightly, but Vettel maintained a strong lead to the checkered flag. Vettel blocked Alonso during the final moments of qualifying on Saturday when the Ferrari driver was arriving at the chicane. Race officials reviewed the incident and reprimanded Vettel but allowed him to keep the pole. That decision may have been a factor in Alonso's aggressive start. Sauber driver Sergio Perez's day came to an end when he spun off the track on the 19th lap trying to pass Lewis Hamilton at the hairpin turn. Perez will replace Hamilton next season at McLaren as the Briton moves to Mercedes. With the winner decided early on, the focus for many of the fans became third place where Kobayashi was battling it out with Button, who won here last year. Kobayashi, who started third, prevailed by half a second to become the first Japanese driver since Aguri Suzuki in 1990 to celebrate on the podium in front of the home crowd. Hamilton finished in fifth, 20 seconds behind Button, and in front of a pack of cars fighting out the lower-point positions. Raikkonen took sixth ahead of Force India's Nico Hulkenberg, with Pastor Maldonado of Williams eighth and Webber recovering for ninth. Toro Rosso's Daniel Ricciardo held off Michael Schumacher of Mercedes to take the last point. In the drivers' championship, Alonso and Vettel look like they'll be fighting it out for the title. Raikkonen is 33 points behind Vettel in third and five points in front of Hamilton. Webber and Button are 59 and 63 points off the lead, respectively. Red Bull extended its lead in the constructors' championship to 42 points ahead of McLaren, with Ferrari another 20 points back.